If you’re one of the approximately 11 million people who reserved a Tesla Model 3, you’ll be getting your car somewhere between the end of next year and 2086. Automotive News notes, however, that Nissan wants you to know you can buy a Leaf right now instead of waiting for a Model 3! Nissan has now turned those reservations into fodder for its own advertising for the electric Nissan Leaf. “No one should have any reservations about getting an electric car today,” trumpets a Nissan ad that appears around the country today. 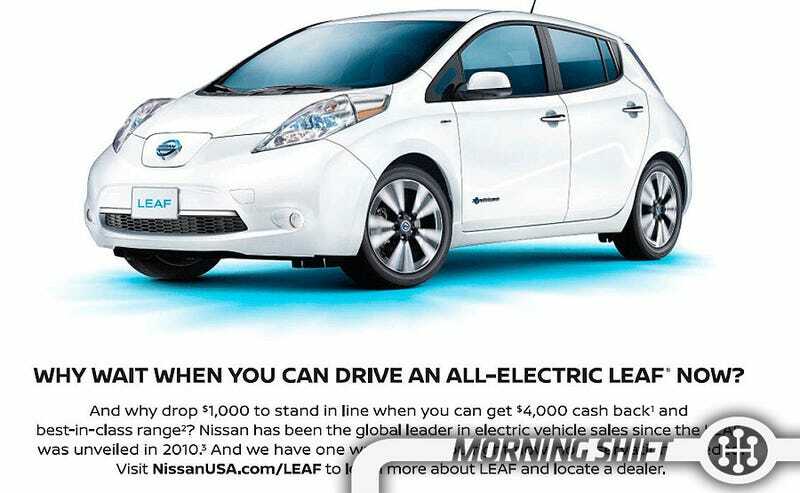 The ads appear in Friday’s New York Times, Los Angeles Times, USA Today and The Wall Street Journal, reminding consumers that Nissan has been mass-producing the all-electric Leaf since 2010. They are right: the Leaf is a car that you can, in fact, buy right now. And a good one. Just not one that will be a 3 Series-fighting semi-autonomous super sedan. Today’s recall is aimed to ensure that a legal loophole allowing manufacturers to throttle back emissions treatment systems under certain circumstances is tightened to make sure lower levels of pollution going forward, the government official said. Daimler and Mitsubishi have similarly found themselves accused of possibly cheating on engine readings. Daimler - the owner of Mercedes-Benz - said late Thursday it is launching an internal investigation, “into its certification process related to exhaust emissions in the United States at the request of the US Department of Justice. We’ll see where this one goes. 3rd Gear: Daimler Checks On Own Emissions In The U.S.
Daimler said it is conducting an internal investigation of its certification process for diesel exhaust emissions in the United States at the request of the Justice Department. Daimler has been under pressure since a lawsuit filed by U.S. Mercedes owners in February claimed that the brand’s diesel models violated emissions standards. Is it a big deal? Possibly, but oddly enough, only the U.S. Justice Department is involved with this one, not the EPA or California Air Resources Board. Evercore ISI analyst Arndt Ellinghorst said the DOJ’s request could be related to some accusations in Europe that Mercedes is using auxiliary emission control devices (AECD) to improve its fuel efficiency. As Toyota recovers from the Japanese earthquakes, its nearby suppliers do the same. Here’s Reuters on why that close proximity is good and bad. Toyota Motor’s (7203.T) close ties to its “keiretsu” - or family of affiliates and suppliers - have helped it become the world’s top automaker. But two major production stoppages this year highlight the risks, too. The car maker’s reliance on Aisin Seiki Co (7259.T), an affiliate, for door and engine parts forced Toyota to halt much of its production at virtually all its plants in Japan this week after an earthquake damaged Aisin plants in the south. The stoppage follows another week-long production halt in February after a fire at another affiliate, Aichi Steel (5482.T) and could initially cost Toyota up to 90,000 vehicles and 30 billion yen ($275 million) in profit, by some estimates. The Detroit Free Press reports that despite a very healthy Q1 report, General Motors’ stock rose only “moderately” yesterday, continuing a recent trend of being unable to convince Wall Street of its overall health and stability. On an earnings per share basis, GM made $1.26, well above the $1.00 consensus of more than 12 analysts’ estimates, and the company’s best first-quarter profit ever. This is the number investors watch closely. But once again investors treated GM like Rodney Dangerfield even after the company asserted it will post a record pre-tax profit for all of 2016. GM shares rose above its November 2010 initial public offering price of $33 briefly in morning trading before closing at $32.66, a 1.5% gain for the day and its highest closing price since Jan. 4. Even as new vehicle sales in the U.S. remain on pace to break last year’s record of 17.5 million, many investors worry that the industry’s cycle is near its peak. There also is concern about the profitability of GM’s investments in ride-sharing, car-sharing and autonomous vehicles will prove to be. The automaker’s shares slid more than five percent Friday morning on the news of the investigation. Will the automaker be the target of another criminal probe?